BombBomb is an official integration supported by Follow Up Boss. It's easy to set up and you'll be sending your contacts videos from Follow Up Boss in no time. You can insert BombBomb videos wherever emails are in Follow Up Boss such as emails, email templates, and email signatures. Head to Admin > Integrations and you'll see a box for the BombBomb integration. Click it to enter the BombBomb integration settings. Follow the steps noted on the page. If you don't have a BombBomb account, you can create one here. If you have an account, you'll need to get your API key, which can be found on your BombBomb Settings Page. Copy the key to your clipboard and paste it into the field in Follow Up Boss. If you are the account owner, you can choose to share your key with the team members on your account. This will let any user who has not saved their personal key use the owner's key. Press save and your BombBomb integration is now set up. After setting up your BombBomb key in Follow Up Boss you'll see a new icon in the toolbar used for formatting emails. Click this button to start using BombBomb in your email, email template, or signature. 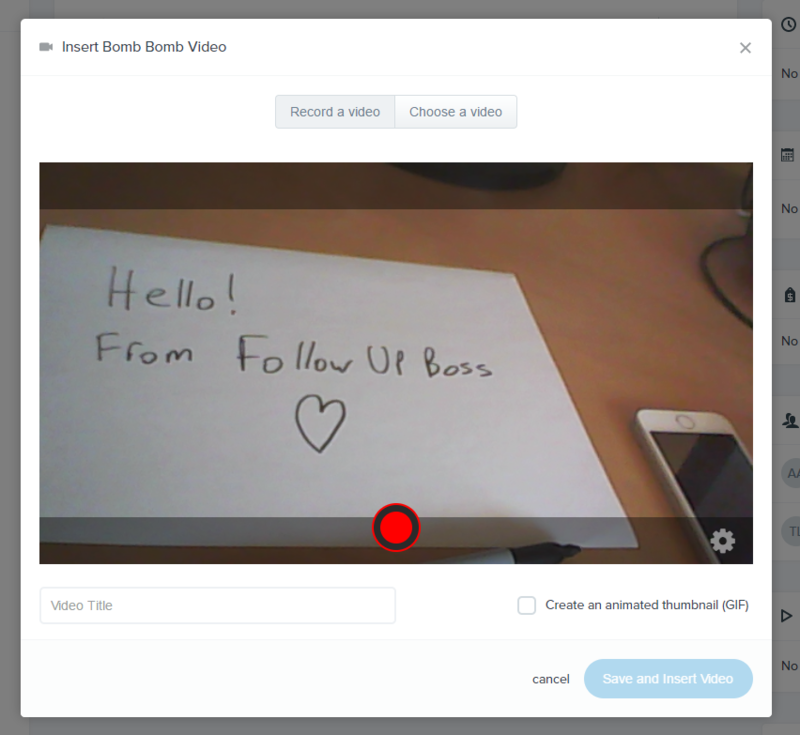 The first screen you'll see when opening up the BombBomb window lets you record a new video to insert into your email. Press the red button to begin recording, and again when done to finish. Name your video and it's ready to go! Press the 'Save and Insert Video' button and you'll see a preview of the thumbnail in the email compose window. Press the 'Choose a video' tab to select a video that you have already recorded. You can use the search bar to narrow your search if you have many videos. Press the eye icon to preview your video before sending it. After finding the video you want to use, click the thumbnail to select it, and press 'Insert Video'. As above, you'll see a preview of exactly how it will look before sending it. You can have emails sent by BombBomb outside of Follow Up Boss show up in your Follow Up Boss history. To do this make sure they are being copied by BombBomb to the same email address that you have synced with Follow Up Boss. BombBomb can sync your Follow Up Boss smart lists as well. See this article for details.